How can cooking and baking be made into a productive hobby? How can ALL the family members get involved in a chore, which is predominantly considered the “woman’s area of expertise”? If yours is a family that loves eating out ALL the time, this article will provide insights as to why this habit might be dangerous, unhealthy and uneconomical all at once. Read on to discover how you could make cooking and baking a family adventure, involving the young and old alike, with an Islamic twist, that would help you earn rewards in dunya and akhirah In sha Allah. Since most families these days are caught up with busy lifestyles and hardly get time to have fun together, baking and cooking something delicious and nutritious could be the best way to bond and build your relationships. You may include your extended family members in this activity too. Have a bake off or cooking competition! Bake cookies, cakes or cook just about anything. Donate the same to a nearby orphanage or old age home. Donating home cooked meals and bringing cheer to innocent lives could be one of the greatest and purest ways of earning rewards and pleasing Allah . Make your kids an integral part of the process so they learn and understand the importance of engaging in charitable acts from a young age, in turn helping them grow up into responsible adults who would be proactive in helping the members of their community in a responsible and highly rewarding manner In sha Allah. Always remember to purify your intentions before undertaking any type of activity that may benefit you or the people around you. Going out for a meal involves spending unwanted amounts of time in heavy traffic. Instead, you could save time by preparing a simple, nutritious healthy meal at home and use that “free time” to involve yourself in productive activities. You could organize a party for your children and their friends for a fun-filled Islamic activity on weekends. Discuss Islamic-related issues, the lives of our Prophets and the numerous lessons one could attain from each surah in the Glorious Qur’an. You may use that time to try out new hobbies or nurture a hidden talent. Perhaps you always wanted to memorize a surah and never found “time” to do it. This is the perfect moment to make a start. Spending quality time trying out new ventures on weekends or just catching up with family members is a great way to refresh your mind and body in a halal manner. Instead, you could spend that money in the form of charity. The type of charity related works you may undertake as a family are limitless. I’ve given a few examples here. Please feel free to add your own ideas to the list in the comments section below. Donate some amount of money to your local mosque to help them help others. Buy a few dawah booklets and gift them to your neighbors/friends/colleagues/etc. It may be a source of guidance or inspiration they were searching for. Besides, Allah will reward you for spreading the message of Islam in a positive way, In sha Allah. Make charity related activity a monthly habit instead of reserving it for the month of Ramadan alone. Home cooked meals are nutritiously balanced because you can consciously try to include foods that are fresh and wholesome – Halaal and Tayyiba: ‘…and eat from what we have provided for you from the earth…‘ [Quran: Chapter 2, Verse 168]. Nutritiously balanced meals have a perfect combination of various vitamins and nutrients, in the right amounts that can help your body stay healthy. This will greatly reduce the risk of consuming fat filled, cholesterol loaded, fried foods that are often served in restaurants and will aid you in maintaining your waistline. Additionally, you could take this opportunity to teach your kids about different foods that were consumed by our Prophet Muhammad , helping them get closer to the seerah in an educative manner. Pre-planning is the key. Save time by planning an entire week’s menu in advance. Buy all your groceries beforehand so you don’t have to go running around and wondering what meal to prepare every single day. Home cooked meals allow you to control portion sizes. How often have you over-eaten and felt stuffed after eating in a restaurant because the portion you ordered was way too big? The amount of salt you add to your meals. The amount of oil you use. The type of food products you include (organic and fresh). The amount of food you cook. Cooking is a life skill! Involve your kids in this fun-filled activity rather than shooing them away from the kitchen. 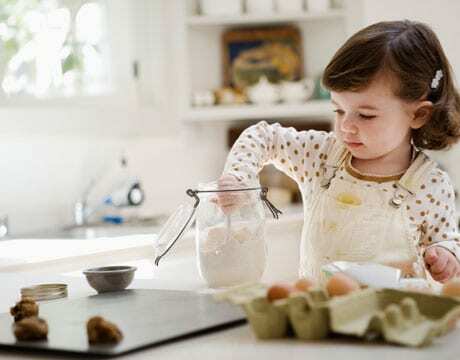 While your cooking area might get a little messy, it is nothing compared to the priceless bond that could build between parents and children. This will also help them grow up into well-rounded individuals; preventing them from wasting time watching television all day long or being engrossed in their handheld electronic devices. There could be nothing more productive than cooking a delicious meal together while catching up with family members. Apart from building bonds of kinship, family time is a great way to build strong foundations with children, which in turn would lead to a healthier and happier Ummah, building a community that would work collectively for bringing about bigger and positive changes. By making this a fun-filled productive family activity, you could earn tremendous rewards in the dunya and akhirah. So let’s get cooking, shall we?